Summary: "The highly anticipated conclusion to Kiera Cass's #1 New York Timesbestselling Selection series, The One will captivate readers who love dystopian YA fiction and fairy tales. The One is the perfect finale for fans who have followed America's whirlwind romance since it began--and a swoon-worthy read for teens who have devoured Veronica Roth'sDivergent, Ally Condie's Matched, or Lauren Oliver's Delirium. The Selection changed America Singer's life in ways she never could have imagined. Since she entered the competition to become the next princess of Illéa, America has struggled with her feelings for her first love, Aspen--and her growing attraction to Prince Maxon. Now she's made her choice . . . and she's prepared to fight for the future she wants. 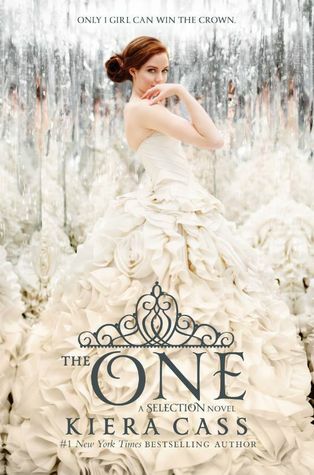 Find out who America will choose in The One, the enchanting, beautifully romantic third book in the Selection series!" Review: HA! I WAS RIGHT! I predicted that a few things would happen, and I totally called it. I love it when that happens. The One was a really solid read. The wavering that America experienced in The Elite was almost entirely gone in this book, and we see the headstrong, clever, and a bit naive girl we met in The Selection once again. The plot picked up considerably between this book and the last book, almost to the point where I wished that some of the main events of The One had occurred in the last book. If Cass had gone that route, this book could have spent more time fleshing out the implications of what the Northern Rebels really wanted, and how to work together to stop the Southern Rebels. It's fine as it is, I'm just being picky. What surprised me the most was the death toll in this book. Good grief, for all the fluff and dresses and dates and threatening-but-never-too-serious rebel attacks that occurred up to this point in the series, the crap got real nasty, very suddenly. It made for some truly shocking moments as some key characters went down, and changed the whole tone of the book. It was for this reason that I didn't love the epilogue. It was a nice moment to have in writing, and I liked knowing the fates of the different characters, but I wished for more of a bittersweet feeling after such an emotionally devastating final couple of chapters. The best part of this novel was the friendships that formed between the final four girls. They truly are very, very different people. Despite their differences, they become unlikely friends and unlikely allies in a really bizarre situation. I never thought I'd like Celeste. But here I am, liking Celeste. Good work, Cass, for pulling that off. I am impressed with the development in each of those four characters, and in the friendship they ultimately shared. I did not, however, buy the friendship between Georgia and America. I can understand them becoming allies, but they simply did not have the time to become the great friends that America claims. Their interactions were brief and rare, too much so to enjoy a trusting friendship. That relationship just always felt off to me. I loved Queen Amberly. I loved discovering who were the sympathizers to the Northern Rebels and really, really wished for more development around those revelations. I loved that conversation between America and Celeste. I loved the rooftop-rain scene. I loved the meeting with the Northern Rebels. I loved how America dealt with the Convicting. I loved the friendships. I loved who America ultimately picked, and that he picked her back. Although it wasn't perfect, I thought it was still very, very well done. I read the whole thing in one fabulous sitting, and I'm sorry to see this series come to an end. It was a fun, tension-filled story, and I had a great time reading! Bottom Line: The One was a fitting and compelling end to The Selection series. There are some things I didn't love, but just as many things that I did love. I'd recommend this to YA dystopia lovers who have a certain proclivity for fancy dresses and prefer romance to be the driving force of the novel.